It seems that tennis star Anna Kournikova was in a little brawl this weekend. Kournikova was at Lavo Nightclub in Las Vegas when another woman accidentally bumped into her. A small scuffle broke out but tensions seemed to ease when the two were separated. Later in the night as Kournikova was leaving, the woman threw a drink on her. A fight ensued, with a lot of pushing and shouting. It ended with Anna being grabbed by the neck and slammed into a wall. Security broke the fight up and Anna left the club shaken up. Kournikova was tended to at her hotel but didn’t require any serious medical attention. Twins Marion Loretta Elwell Broderick and Tabitha Hodge Broderickwere born last week in Ohio. As we all know, Sarah Jessica Parker used a surrogate mother for these babies, seeing as she’s 50 and super rich. A statement released at the time of birth said “the babies are doing beautifully and the entire family is over the moon.” They sure look over the moon here. This is a pretty great picture. The whole clan, even son James Wilkie, is together. They seem to be incredibly happy for their new children. Good for them. I will say that Matthew’s hair looks very seventies to me, though. Maybe he’s doing it for a film? Either way, I like it. It makes my Luke Skywalker hairstyle look fashionable. The bad news keeps coming for Kate Gosselin. The newly-single mother of eight had a cook book scheduled to come out in November. Now the publisher, Zondervan, says the book is being postponed. The title of the book was Love is in the Mix: Making Meals into Memories. That doesn’t sound like an appropriate title considering the latest events in the Gosselin house. The publisher said that it’s working with Kate regarding the book, attempting to adjust to her new situation. They dang well better, because the inside jacket of the book called it “an inside look at one of America’s most close-knit families”. Yeah, maybe not anymore. Gosselin has released two previous books, both best-sellers. Maybe she can start a new one since her show is on hiatus until August. Hot or Not? Britney is Brunette! Dawn Richards is the only female that made it out alive after money maker/money taker Diddy, decided to break up female pop group Danity Kane. But it seems to me that the only way she’s staying relevant is by copying someone else’s style…Rihanna. Richards went from long hair to short and high Rihanna hair. Not to mention she also tries to mimic Rihanna’s fashionable style. 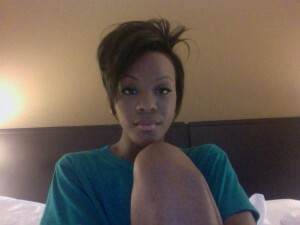 Here is a picture she posted on Twitter of her new hairdo; looks a lot like Rihanna’s don’t you think? Michael Jackson left concert promoter AEG Live with a valuable commodity, his final performance. The death of Jackson surely meant concert promoter, AEG, would take a big bath after sinking millions into the now-defunct “This Is It” tour, or would they? It has been learned AEG, as part of the deal with Jackson, was taping his rehearsals including Jackson’s eve-of-death performance at the Staple Center, in pristine, multi-camera high-definition and multi-track audio. The DVD was suppose to be the spawn of Jackson’s “This Is It” tour, however, the recordings are now planned as the main event, and what an event it will be. Online retailer, Amazon, sold out of its entire stock of Michael Jackson related materials, in mere minutes after his death from heart failure on Thursday. If Jackson’s post-death record sales are any indication of how this final performance might sell, then AEG just hit the jackpot. The DVD/CD would include Jackson’s last full rehearsal, singing all his hits live on stage surrounded by dancers and acrobats and at times suspended from a crane. Would you buy this Album/ DVD? Why oh why must Bravo torture our eyes with the sight of these botox and silicone induced women of New Jersey. It’s been confirmed that the Desperate…I mean Real Housewives of New Jersey will come back for a season 2. The only thing exploding from those real housewives are fake bubbies and botox. No word on when filming will take place, but will you be watching? —Collaboration: “Blame It,” Jamie Foxx featuring T-Pain. —Male Hip Hop Artist: Lil Wayne. —Female Hip Hop Artist: M.I.A. —Video of the Year: “Single Ladies (Put a Ring On It),” Beyonce. —Video Director of the Year: Benny Boom. —Viewer’s Choice Award: “Live Your Life,” T.I. —Humanitarians of the Year: Alicia Keys and Wyclef Jean. Percentage of tweets containing the words “Michael Jackson” sent next week. 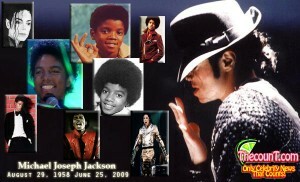 What will happen Jacko’s remains? Will Neverland Ranch be Michael Jackson’s Final Resting Place?